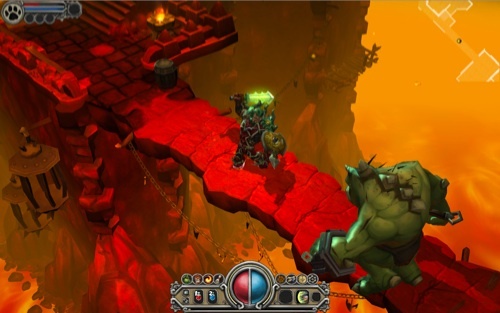 With Diablo III still a year, if not more, away - Torchlight could be a game to fill that void. 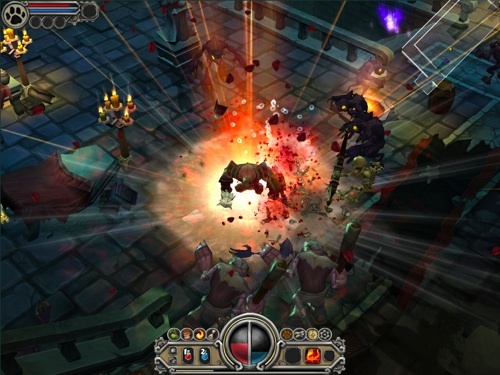 It shouldn't come as a surprise since Runic games president Max Schaefer was co-designer of Diablo 1. While the $19.99 title doesn't ship with co-op included, there's hope in the future that we could see it in some form in two ways. First Torchlight will be turned into a free MMO by Runic games in the near future, and while technically not co-op by our definition it's as close as you can get. The other way we might see cooperative play is thanks to the expandability of the game, Runic is shipping Torchlight with an entire suite of mod tools. Like we said earlier, the game shares a lot in common with Diablo in play style. What we have here is a top down hack and slash RPG with tons of items to collect and customize. There are three characters to choose from: The Destroyer who is your barbarian type character, The Vanquisher who is a ranger type class, and the Alchemist who is your wizard. Every class can you any weapon in the game, but certain weapon types will yield bonuses when used with the "correct" class. Another unique feature Torchlight has to offer is your sidekick, your pet, either a cat or dog. This animal will help you attack, act as a pack mule for you, and can even be sent to town to sell off items so you don't have to leave one of the games randomly generated dungeons. That's right, no memorizing dungeons here as they are all procedurally generated. Getting my hands dirty with the game I was immediately impressed with the look and feel. While I wouldn't call the game cartoony, it's very colorful and lively - with the seven unique areas popping off the screen. Truly gorgeous looking graphics in zones like Lava filled caves, Crypts, Sunken ruins, and even a tech filled area with robots all look amazing thanks to the open source Ogre 3d engine. Runic claims the game has about 24 hours of story to work through, one in which you need to discover the mystery of Ember - a magic like substance located under a town. With a level cap of 100, you should beat the game at about level 35. So what do you do after that? You can go back and keep playing more randomly generated dungeons and leveling up your character adding to it one of the many skills available in the game. I played as a Alchemist during my short play session and chose a dog for my companion. It wasn't long before I was exploding some of the 40+ creatures in the game. While some of my spells worked well enough, it was once I found a rifle that I really started enjoying the attacks in the game. The developer was kind enough to show me some of the later content of the game and I got to see spells like teleportation, fire grenades, freeze clouds and even an insanely powerful laser beam. With the little time I had with Torchlight on the floor I really was impressed. Gameplay was smooth, fast and fun. It looked gorgeous, and at $19.99 seems like a steal. I'm disappointed there won't be co-op in it, but hopefully the mod community can figure things out. Either way I'm picking this game up on October 27th. Page created in 0.5715 seconds.